If doubts about the sincerity of the feelings of the chosen one have crept into your heart, then we recommend that you use fortune telling on your loved one. With the help of simple magic rituals you can find out whether he loves you and what awaits you in the future. Not sure about your faithful? Try to learn about his attitude to you with the help of fortune-telling on the egg. Take a glass of water, a chicken egg and a red candle. Light a candle, put an egg in a tablespoon and bring it to the flame. Say about yourself seven times, closing your eyes: “He loves, does not love, waits, does not wait, thinks, does not think. Tell the whole truth! ” After these words, break the egg and pour the protein into a glass of water. Now carefully consider the shapes that have arisen in the water. Ship — a man is not indifferent to you and wants to be with you; A heart — he loves you; Butterfly — he has not serious intentions towards you; Bird — he is indifferent to you; Person — he does not love another woman; Tree — he likes you very much; Spider — he has selfish goals in relation to you; Bonfire — he is jealous of you and wants to possess you. If the protein immediately plunged to the bottom, then you should not guess that day. In the event that the resulting figure is not similar to what was listed above, you should connect your imagination and hold their associations. 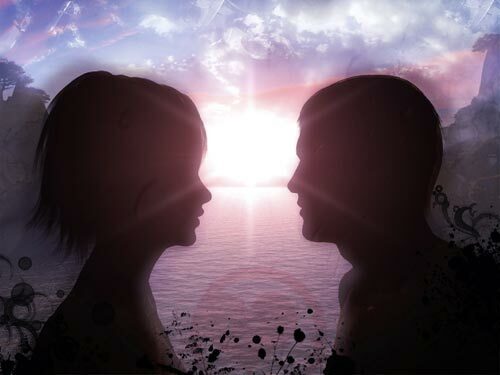 To find out what awaits you next to your loved one, you can use the card divination for love. Take the cards and lay out the king of hearts and the lady of hearts. The king will symbolize your lover, and the lady will symbolize you. Shuffle the deck and place the first three cards on the table. If there are two cards of the same suit among them, or all three of the same suit come out, then set them aside. Move the remaining card to the other side. Then again, lay out three cards from the deck and remove the matching suits. So lay out until the cards run out. Those cards that remained, and predict your future with your loved one. It is possible to interpret this alignment according to the standard value of cards for divination. If you want to know how your fate will be with your chosen one, then we recommend that you use fortune telling on the ring. To do this, you need to take your ring (preferably silver or gold), a candle and a saucer with water. Dip a ring in a saucer and start dripping wax on it from the candle. If the wax figures close the ring, then the relationship with the person will be complicated and will not last long. If the wax has drifted away, then your love is threatened by nothing. If the wax froze around the ring, your relationship will be long and happy, your guardian angel will protect your couple.